April can be a delightful time to visit much of the United States. April may be time for some spring break and Easter travel, but, in general, this is shoulder season, when it is possible to find mild to warm weather (ideal for touring) and travel deals to many destinations. Many places hold festivals to celebrate the end of winter and make for a great excuse to take an April trip. April weather can be unpredictable across the country. You're more likely to see cold temperatures and bad weather if the winter months were particularly harsh. When deciding whether or not to take a trip, especially earlier in the month, consider what the winter temperatures were in wherever you want to go. If it was stormy and freezing all season long, consider waiting until late in April to make the trip. April can be quite windy and rainy as cooler temperatures give way to the longer, warmer days of spring. If you don't see the "fun" in getting caught in the rain, avoid places in the Pacific Northwest, such as Seattle and Portland. Rain in the region is standard throughout the year, but showers are guaranteed throughout the spring. Summer downpours in the Southeast are far off, and places like Florida and Louisiana typically see more sun than they do in the summer. If you are traveling with children and are afraid of a rainstorm trapping you in a hotel room, head to a big city like Boston or San Francisco. Museums and other kid-centric activities are easy to find, and the perfect way to pass the time during bad weather. Given the many different climates in the United States, a packing list for your April trip can vary considerably depending on what you're planning to do. A beach vacation, after all, looks very different than a trek through the Grand Canyon! The northeast part of the country will require a packing list with many winter staples: A coat, a scarf, gloves, and other accessories are still necessary. But a trip to the south may include a bathing suit, sandals, shorts, and other warm-weather gear. It indeed depends on where you're visiting. Regardless of where you're traveling in the U.S., an umbrella and comfortable walking shoes are must-pack for April. 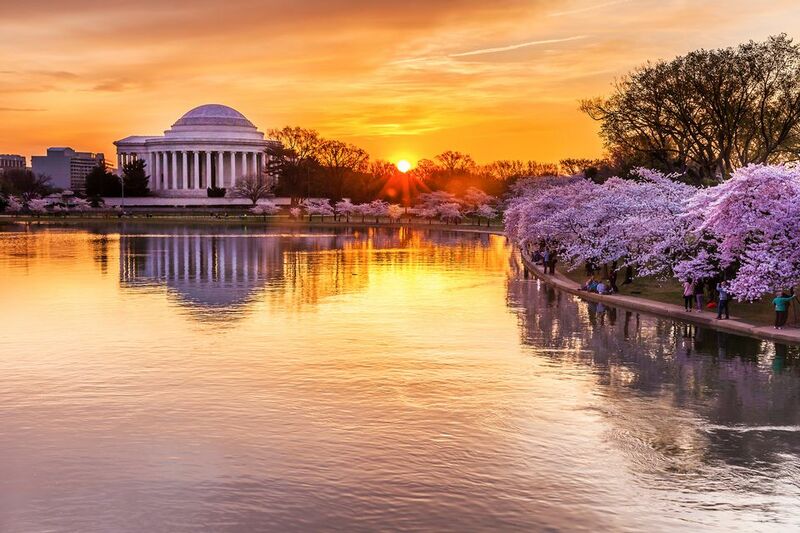 The National Cherry Blossom Festival: Held in Washington, D.C., this event runs from the end of March through mid-April. The blossoms are spectacular, and temperatures in the low 70s make for perfect strolling weather. Easter: Many schools are closed for the days surrounding the holiday, which typically falls in early April. Most churches hold Easter egg hunts and other festivities. Easter brunch is also a favorite tradition for many families. Major League Baseball: The season kicks off in April. The sitting president typically throws out the season's first pitch, and there are usually upwards of 100 games during April alone. Earth Day: A popular day for education and celebration in the U.S. Held on April 22, many cities commemorate the day with parades, protests, and other events. Miami Food and Wine Festival: The city's top chefs create dishes for festival-goers to sample, paired with top-quality beers and wines. The event takes place the third week of April. Tribeca Film Festival: One of the world's best film festivals, New York City's biggest takes place the last two weeks of April. The event screens independent films and draws huge celebrity names. Some schools observe spring break during April (specifically close to the Easter holiday weekend). Because of this, some of the country's most popular family destinations, like Disneyworld, will be especially crowded. The U.S. is home to stunning national parks—and many of the best ones are less crowded during the spring. If you want to get outside, April is a great month to do it. Spring is shoulder season for many destinations, like Alaska. This means deep discounts on lodging, airfare, and in some cases, tours and other activities. A few popular ski resorts, like Telluride in Colorado and Mount Bachelor in Oregon, remain open into early April for snow bunnies who don't want to leave the slopes.